Want to connect with Tepnaree? My name is Tepnaree Kaewbuadee or Nan. I’m 26 years old. I’m from Thailand. 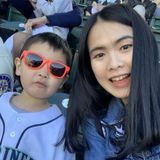 I have been an au pair in Bothell, Washington since September 2017. I’m taking care of 1 girl who is 10 years old and 2 boys ages 2 and 4 years old. The oldest host kid goes to school. I usually spend time with the 2 boys. I give them breakfast and lunch, change diapers, read books, sing songs, take them to the park and teach them the ABC’s, coloring and how to count numbers. I pick up my oldest host kid at school. and I also help my host family to clean up the kitchen, living room and do laundry. I has worked 45 hours a week Monday through Friday, Starting at 8 am to 5pm. I have my Washington driver license and I drive a car every day. I will finish my au pair program in September 2019. I’m looking for host family who can sponsor me as a living caregiver program. I am adaptable, patient, highly responsible, manage time efficiently and I am a flexible person. Adaptation is important to work with people because everyone is born and grows up in different families, different cultures and different environments. So, I have to learn and adjust myself to live and work with others. I am always patient to every situation and highly responsible on all my duties that I have to accomplish. And I also manage time efficiently and I am a flexible person because I know that sometimes my host family have something that they have to finish on a certain time. So, I can help them as much as I can help. Taking care of children is another aspect that I always enjoy and I have a lot of fun taking care of them. I think they do not want anything from us except love and care. I want to supervise their learning and make sure they receive nutritious meals, which is important for the child development. Now I have documents such as resume, dear host family letter, reference from au pair program, Washington driver license copy transcription and graduation certificate. I’m in the process of getting FBI records and I will renew CPR and First Aids soon. Thank you for your consideration and time. If you are interested or have any questions, feel free to message me.